Juvenile cuttlefish. Papua New Guinea. A mantis shrimp (Odontodactylus scyllarus) peers out of its den. Indonesia. A bright orange bristle star on a soft coral. Tonga. Juvenile Hawaiian Saron shrimp (Saron marmoratus) collected as postlarva, raised in my aquarium and photographed in the studio. Hawaii. Larval squid releasing ink. Papua New Guinea. Green-eye dancing shrimp (Cinetorhynchus sp.). Fiji. Emperor shrimp (Periclimenes imperator). Philippines. Two fairy crabs (Lauriea siagiani). Papua New Guinea. Crinoid shrimp (Hippolyte catagrapha). Philippines. Nudibranch (Nembrotha kubaryana). Papua New Guinea. Squid larva - 12.6 mm TL. Papua New Guinea. Emperor shrimp (Periclimenes imperator) lives commensally on a number of hosts, including this sea slug: Hexabranchus. Philippines. Porcelain anemone crab (Neopetrolisthes maculosus) on a carpet anemone. Indonesia. Two giant basket stars (Astrophyton muricatum) at night. Indonesia. Yellow spotted guard crab (Trapezia flavopunctata) collected as postlarva, raised in my aquarium and photographed in the studio. Hawaii. A sea cucumber (Holothuroidea sp.) extends off the reef and releases gametes in the current. Atlantic triton's trumpet (Charonia variegata) feeding on a cushion sea star (Oreaster reticulatus). Sea stars are the triton’s primary prey item. A trumpet snail paralizes its prey with an injection of toxic saliva, and then bores through the body with its strong teeth. Adult trumpets are heavily collected for their beautiful shells, which has allowed sea star populations to proliferate in recent years. Bahamas. Octopus larva - 9.5 mm TL. Papua New Guinea. Emperor shrimp or Imperial shrimp (Periclimenes imperator) lives commensally on a number of hosts, including this sea slug: Hexabranchus. Philippines. Mating nudibranchs (Nembrotha lineolata). Indonesia. Harlequin shrimp (Hymenocera elegans) feeding on a sea star (Linkia sp.). Indonesia. A flamboyant cuttlefish (Metasepia pfefferi) lifts off from the muck in search of food. Indonesia. Mantis shrimp larva - 65.0 mm TL. Papua New Guinea. Fairy crab (Lauriea siagiani). Papua New Guinea. Bristle star and crabs on a soft coral. Papua New Guinea. Brain coral (Leptoria phrygia) pattern. Bahamas. Giant marine hermit crab (Petrochirus diogenes ) on a wreck in the Bahamas. A close-up of the of the red pencil urchin's (Heterocentrotus mammillatus) spines and skeleton (test). Hawaii. Squat lobster on a sponge. These decapod crustaceans are not lobsters at all, but are more closely related to porcelain crabs, hermit crabs and then, more distantly, true crabs. Halmahera, Indonesia. Juvenile squid schooling at night. Florida. A spotted spiny lobster (Panulirus guttatus). Bahamas. Saron shrimp (Saron marmoratus). Saron shrimps are quite variable in color and pattern. They may have greenish, brown, or even red, purple or blue markings. Ambon, Indonesia. Crab megalopa collected in an egg tow. Hawaii. Soft coral crab (Hoplophrys oatesi). Indonesia. Collected pelagic copepod (Sapphirina sp.) - 4.5 mm TL. Hawaii. Humpback shrimp (Saron sp.). Fiji. Peacock mantis shrimp (Hemisquilla ensiger). Papua New Guinea. A pair of harlequin shrimps (Hymenocera elegans) feeding on a starfish (Linkia sp.) in Indonesia. Juvenile octopus reflects off the surface (Octopus sp.) in Papua New Guinea. Anemone hermit crab (Dardanus pedunculatus). Indonesia. 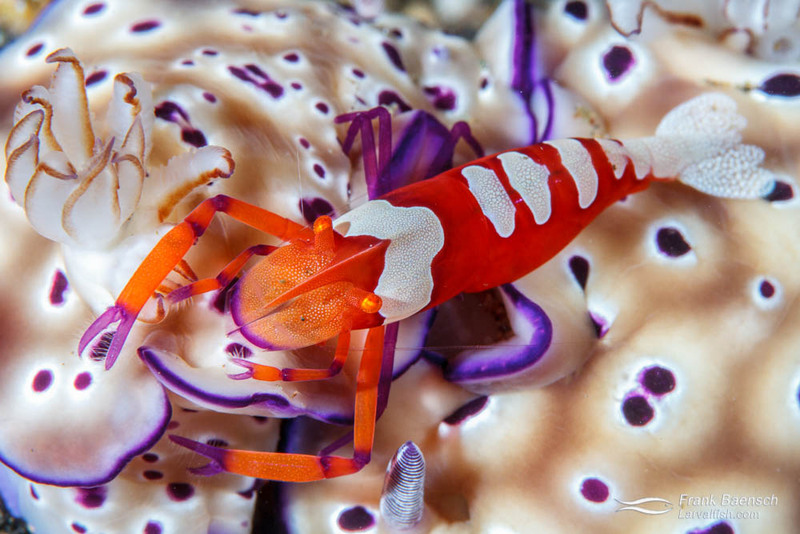 Two bubble coral shrimp (Vir philippinensis) in an anemone. Papua New Guinea. Barred wire coral shrimp (Pontonides sp.). Fiji. Crown jellyfish (Cephea cephea) off Oahu, Hawaii. Crown jellyfish have a deep groove running around the bell, giving them the crown shape from which they take their name. Hawaii. A swimming bristle worm at night. Indonesia. Swimming pelagic marine copepod (5.7 mm). Hawaii. A banded coral shrimp (Stenopus hispidus) in the Bahamas. Head on shot of painted spiny lobster (P. versicolor). Fiji. Collected pink jellyfish (Pelagia species). Hawaii. Bird's eye view of painted spiny lobster (Panulirus vesicolor). Indonesia. Head on shot of spiny tiger shrimp (Phyllognathia ceratophthalmus). Indonesia. Crab on a softcoral. Papua New Guinea. Crown jellyfish (Cephea cephea) on a night dive. Crown jellyfish have a deep groove running around the bell, giving them the crown shape from which they take their name. Hawaii. Nudibranch (Nembrotha sp.) on a tunicate. Indonesia. Spider crab (Hyastenus bispinosus) on gorgonian. Fiji. A reef squid (Sepioteuthis sp.) in full irridescence. Cephalopods create this amazing camouflage using specialized color changing cells (chromatophores) and reflecting cells (iridocytes) in the skin. Indonesia. Reef Squid (Sepioteuthis sp.). Like all cephalopods, squid have a distinct head, bilateral symmetry, a mantle, and eight arms. There are around 300 species of squid. Indonesia. Saron shrimp (Saron sp.) in a crevice. Papua New Guinea. Collected sea swallow (Glaucus atlanticus), a pelagic aeolid nudibranch. Hawaii. Common octopus (Octopus vulgaris) out and about on a colorful reef. Indonesia. Collected blue pelagic shrimp. Hawaii. Squat lobster in a crinoid. Indonesia. Anenome shrimp (Periclemenes sp.). Indonesia. Crab larva hitching a ride inside ctenophore. Hawaii. Crab on dendronephthya soft coral. Indonesia. Head shot of a pelagic shrimp. Hawaii. Lobster larva near settlement. Indonesia. Head on shot of peacock mantis shrimp (Hemisquilla ensigera californiensis) carrying a large clutch of eggs. Philippines. Emperor shrimp (Periclimenes imperator) on a sea cucumber. Indonesia. Blue-ringed octopus (Hapalochlaena lunulata) juvenile on Halimeda algae. Papua New Guinea. Saw blade shrimp (Tozeuma armatum) carrying eggs. Philippines. Nudibranchs (Chromodoris willani) at night. Philippines. Anenome shrimp (Periclemens sp.). Indonesia. Spotted spiny lobster (Panulirus guttatus). Bahamas. Harlequin shrimp (Hymenocera elegans). Philippines. Nudibranch on a tunicate. Indonesia. Head on shot of a shrimp's eyes. Philippines. Nudibranch (Nembrotha purpureolineata). Papua New Guinea. Crinoid squat lobster (Allogalathea elegans). Indonesia. Bigfin reef squid (Sepioteuthis lessoniana). Philippines. Collected unidentifed pelagic crustacean larva. Hawaii. Odd looking donald duck shrimp (Leander plumosus) on a coral. Indonesia. Two-spot lizardfish (Synodus binotatus) with four stages of parasitic isopods. Tonga. Chambered nautilus (Nautilus pompilius). Papua New Guinea. An emperor shrimp (Periclimenes imperator ) on a serpentine sea cucumber. Indonesia. Blue boxer shrimp (Stenopus tenuirostris). Indonesia.